Gold Coast superstar, Gary Ablett, has won his second Brownlow Medal overnight in a nail biting conclusion at Melbourne’s Crown Casino. The Suns Captain pipped former Geelong team-mate Joel Selwood and Collingwood’s Dane Swan late in the tally count. Ablett took an expected early lead in the voting but had to come from behind in the final round scoring 3 votes to clinch the AFL’s Best and Fairest award by just 1 vote, with a total of 28 polling points. Geelong’s Joel Selwood took a late lead in Round 21 to overhaul Ablett’s advantage whilst Collingwood’s Dane Swan collected 3 votes over Rounds 21 and 22 to be 1 point clear of Ablett on 26 and 25 respectively. Neither Selwood nor Swan gained votes in Round 23 therefore the AFL’s CEO Andrew Demetriou announced the Gold Coast Suns v GWS Giants match last, finally revealing Ablett as the 2013 winner with 3 votes to win by 1 at the death. 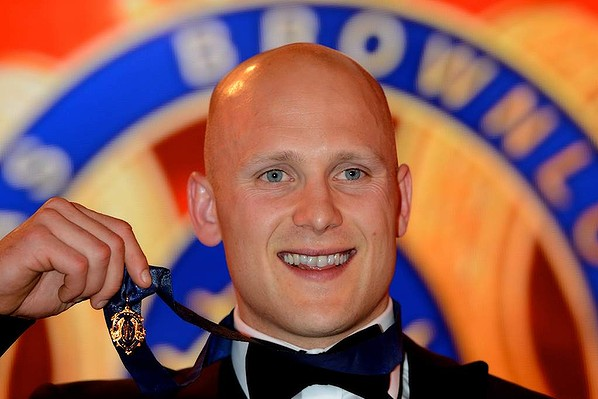 Ablett, who won the medal with the Geelong Cats in 2009, is the fifth player to win Brownlow Medals at different clubs, joining Ian Stewart, Peter Moore, Greg Williams and Chris Judd. This entry was posted in AFL and tagged Ablett, AFL, Andrew Demetriou, Aussie Rules, Australian Rules Football, Brownlow Medal, Dane Swan, Gary Ablett, Geelong Football Club, Guy McKenna, Joel Selwood on September 24, 2013 by bradeveleigh. Backline: Corey Enright (Geelong), Scott Thompson (North Melbourne), Michael Johnson (Fremantle). Half-Backs: Jarrad McVeigh (Sydney) – Sam Mitchell (Hawthorn) – Harry Taylor (Geelong Cats). Centre-line: Joel Selwood (Captain) (Geelong) – Ryan Griffen (Western Bulldogs) – Scott Pendlebury (Collingwood) . 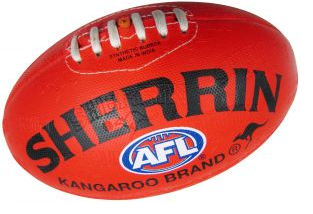 Ruckmen: Gary Ablett (Vice Captain) (Gold Coast Suns) – Will Minson (Western Bulldogs) – Dane Swan (Collingwood). 12 players honoured for the first time. Jeremy Cameron (GWS Giants) became the first All-Australian in the club’s history. Cameron kicked 62 goals from 21 games and took 106 marks. Chad Wingard (Port Adelaide) made the team in just his second AFL season. Andrew Mackie finally made the cut after being nominated on two previous occasions, three premierships and 197 games. Joel Selwood (Geelong) was named Captain with Gary Ablett (Gold Coast Suns) as Vice Captain. Gary Ablett has become the first VFL/AFL player in history to win All-Australian selection in seven consecutive seasons. Collingwood’s Dane Swan was named for the fifth straight season and it’s four in-a-row for teammate Scott Pendlebury. Out of the 12 clubs represented in the 22-man team, Geelong has four players – Collingwood and Sydney each have three. Chad Wingard kicked 40 goals from 59 shots and took 101 inside 50’s. Jarryd Roughead kicked 68 goals to win the Coleman Medal. This entry was posted in AFL and tagged AFL, All-Australian, Andrew Mackie, Chad Wingard, FOOTBALL, Jarrad McVeigh, Jeremy Cameron, jobe watson, Joel Selwood, Sydney, travis cloke on September 17, 2013 by bradeveleigh. Australia’s largest ever match-fixing scandal has come to light in the Victorian Premier League as six men have been arrested in relation to the appalling sports allegations. A manager, Goalkeeper and Malaysian national have allegedly been involved in the operations of the scam that has been reported to be valued at over $2 million. The majority of the winnings are to have been collected from abroad with bets being placed on the bottom-placed Southern Stars in coordination to score manipulation. 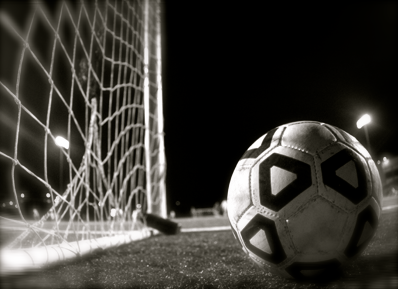 The Victorian Police were informed last month of the happenings by Football Federation Australia, who received information from a Swiss-based betting data intelligence agency, Sportradar. 45-year-old Malaysian citizen Gerry Gsubramaniam of Clayton South has been accused as the main man, or as described in reports as the point of contact for the Southern Stars players. Mr Gsubramaniam is facing five charges of facilitating conduct that corrupts or could corrupt the outcome of a betting event and five charges of engaging in conduct that corrupts or could corrupt the outcome of a betting event. A hearing was held last night (Sunday) where acting Senior Sergeant Scott Poynder stated that Mr Gsubramaniam was the contact point and he received payments for giving Southern Stars players information on how games were to develop. Sportradar had informed Poynder that there were at least five games identified as suspicious and this was presented at the hearing as well. He opposed bail and Gsubramaniam was remanded to appear at the Melbourne Magistrates court on today (Monday). Goalkeeper Joe Wooley (23) and Reiss Noel (24), both UK citizens currently residing in Preston, faces eight charges, including four counts of engaging in conduct that could corrupt the outcome of a betting event, and four charges of facilitating conduct that could corrupt the outcome of a betting event. A further three other men, including the Manager were released on bailed and are to appear before the Melbourne Magistrates court to face the same set of charges as Noel and Wooley. Four other men that were arrested on Sunday were released awaiting further inquiries. This entry was posted in Football and tagged FFA, FOOTBALL, Football Federation Australia, Gambling, Gsubramaniam, Match Fixing, soccer, Southern Stars, Victorian Premier League, VPL on September 16, 2013 by bradeveleigh. 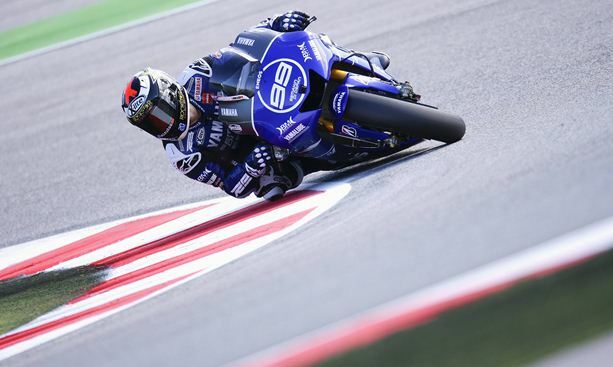 Jorge Lorenzo has triumphed at the San Marino grand prix reigniting his bid to defend the Championship title. Lorenzo started behind Marquez but managed to the lead and built a two seconds advantage in the opening two laps. Marc Marquez who finished second, has now extended his overall lead to 34 points sitting on a comfortable 253 points in total with Lorenzo and Dani Pedrosa who are level on 219 points. A fortnight after his victory at Silverstone, he said it is important to be fighting in every event. “It is important to win, because we don’t lose points but we have only recovered five points, so it is the same as Silverstone,” said the Spaniard. Pedrosa admitted he struggled with edge grip on his tyres especially when taking the corners. This entry was posted in Motor Sport and tagged Dani Pedrosa, Jorge Lorenzo, Marc Márquez, MotoGP, San Marino on September 16, 2013 by karenunchained. Floyd Mayweather has beaten Mexican Saul Alvarez with a 12-round majority decision to remain the best pound-for-pound boxer. The 36 year old, has stretched his string to 45 straight fights and earned the biggest purse in boxing history at a staggering $US41 million. “It is about skills,” Mayweather said. “I came out tonight and showed my skills. Alvarez was no match for Mayweather who fought a brilliantly tactical fight in front of a crowd of 16,746 at the MGM Grand Hotel’s Grand Garden Arena. Mayweather cruised through the 12 rounds yet the judges made it a majority decision with Judges Dave Moretti (116-112) and Craig Metcalfe (117-111) had it for Mayweather, while judge C.J. Ross scoring it a controversial 114-114. In only his second fight since being released from prison after serving a sentence for the assault of the mother of his children, Mayweather gave away 13 years in age and 15 pounds to the younger and stronger Alvarez, who moved down in weight for the showdown. 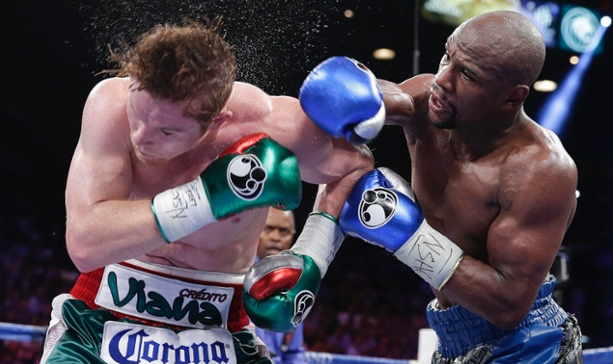 The seventh was one of Mayweather’s best rounds as he landed several combination punches early before backing Alvarez up into a corner and hitting him with a right uppercut that snapped the Mexican’s head back. Alvarez suffered the first loss of his career since turning pro in 2005. This entry was posted in Boxing, More Sport and tagged Alvarez, Boxing, Floyd Mayweather, Mayweather, Saul Alvarez on September 15, 2013 by karenunchained. 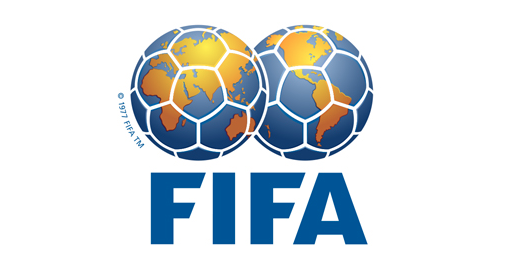 This entry was posted in Football and tagged Bosnia-Herzegovina, Brazil, Ecuador, England, FIFA, FOOTBALL, Germany, Ghana, soccer, United States, World Rankings on September 13, 2013 by bradeveleigh. 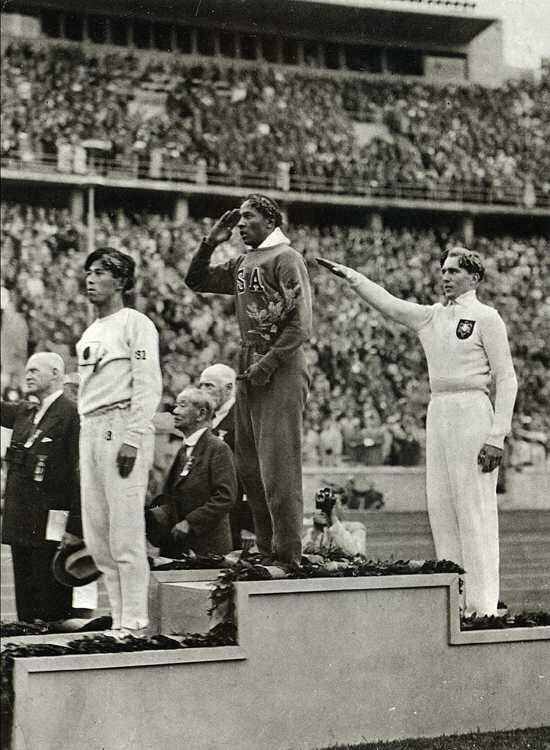 Jesse Owens after winning the long jump at the 1936 Olympics in Nazi Germany. Owens finished with a total of 4 gold medals at the games. This entry was posted in Memory Lane and tagged 1936 olympics, jesse owens, long jump, nazi germany, olympics on September 12, 2013 by bradeveleigh.